EnerLogic Low E Window Film was launched by Eastman Chemicals back in 2010 in a 35% light transmission. This incredible all season window film revolutionized the decades old window film industry and provided a huge competitive advantage over our 3M competition. The EnerLogic 35 filters out 76% of the total solar energy and a remarkable winter U Value that insulates the glass maintaining an interior glass temperature that equates to 93% of the winter room temperatures. In 2011 Eastman augmented the portfolio with the EnerLogic 70. This virtually clear all weather window film was nearly invisible and set a new gold standard for Low E films particularly when the objective is to drive comfort all year round without changing the look of your windows. 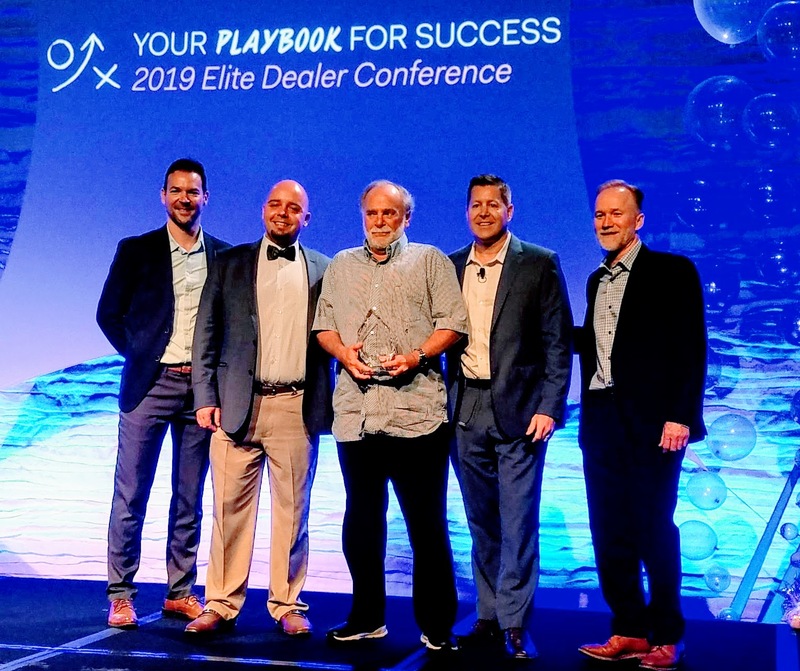 The consumer and commercial markets were incredibly enthused with this product and the summer and winter benefits as well as the ROI that EnerLogic 35 (for Florida homes and businesses) delivered. Our team has installed EnerLogic on a diverse number of residential and commercial applications throughout these six years and the Eastman technical team has compiled numerous Case Studies and White Papers outlining the performance characteristics of these innovative films. Recently 3M launched their version of a light 75% transmission Low E film. Their Thinsulate 75 (Tint So Late) has less summer heat rejection than our EnerLogic 70 and far less heat rejection than the affordable EnerLogic 35. EnerLogic has a better ROI and price point and the thousands of documented installations, NFRC ratings and real-world use over their new product is remarkable. We’ve learned a thing or two since 2010. Innovative Vs. Commodity Window Film. Understanding The Differences. It’s a classic argument that many industries face. How does a savvy consumer determine the difference between a generic window film and a quality innovative window film? At the dawn of window film back in the 1960’s many of the solar window films failed thanks to dyes that were not built for the long haul. These coatings would change color (purple) and the adhesive would fail in a short period of time. You might think that given 50 years no reputable window film manufacturer would make a film that turns purple; but you’d be incorrect. There are to this day window films that are made with dyed coatings. They are short lived but cheap. There are also corners that can be cut when a window film manufacturer wants to make a low cost window film. There are less expensive adhesives. The cheaper adhesives will fail, bubble or peel. There are less expensive ways to metalize a film. Eastman Chemicals manufactures highly innovative and superior quality window film. These coatings are designed to stay effective for decades. The performance characteristics have been tested (NFRC) and their standards are the highest ISO ratings. 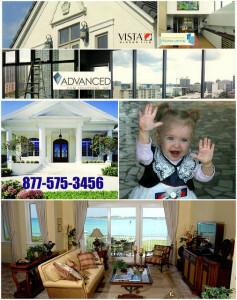 Advanced Film Solutions with offices in tampa, orlando and Sarasota installs these Eastman Films under the brands, LLumar, Vista. Huper Optik and FormulaOne. Florida homes and businesses are faced with a constant heat, glare and UV challenge and getting the best results and a lifetime of comfort demand the innovation and ingenuity of Eastman! Today’s consumers can enjoy the benefits of IR heat blocking window film thanks to advances in thin film technology and in particular nanotechnology. The technical aspects aside there are confusing statements frequently made that tend to misrepresent the efficacy of these films. 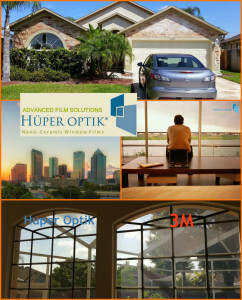 Advanced Film Solutions promotes Eastman ceramic films, notably the patented Huper Optik films. These films are available in numerous light transmissions from dark to invisible. The confusion generally results from the distinction between IR wavelengths and visible light wavelengths of Sun’s electromagnetic energy. 50% of heat is produced by the visible light spectrum and roughly the same amount of heat is produced by the invisible IR wavelengths. A window film that can block 100% of the IR wavelengths (there is no such animal by the way!) would still allow 50% of the visible light heat unless some mechanism was used to lower the visible light transmission. This is a very important clarification because many misinformed window film people highlight the IR wavelength rejection as the only cogent factor for heat reduction. They may also try to support that error by demonstrating IR heat lamps that give the illusion that the IR wavelength rejection is the entire issue. It’s the combination of IR rejection and visible light rejection that produces the most effective measures to combat heat. This becomes a balancing act and the consumer can choose just how dark or light they want their film to be. The NFRC has provided a valuable resource for consumers to acquire factual performance characteristics rather than sales hype or ignorance of the physics behind heat. Advanced Film Solutions coatings are all NFRC rated and we encourage the comparisons because we appreciate that facts overcome illusion. While you may be suffering from turning your clocks forward by one hour Saturday evening it’s a sure sign that hotter days are looming just ahead. Bright light and heat fades your furnishings. Your AC bill is higher than ever and it seems to grow every year. Window film is an often overlooked remedy but clever homeowners are saving up to 30% a month on summer electric bills thanks to today’s solar control window films. Imagine a thin transparent film that can filter out 99.9% of harmful UV rays and up to 85% of the total solar energy from entering your home? That’s what an application of lifetime warranted optically clear window film can provide. 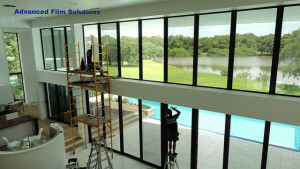 Advanced Film Solutions, office in Tampa Bay, Orlando and Sarasota has helped nearly 10,000 clients get energy smart and incredible comfort with window film. Our clients select the perfect customized solution based on their requirements and aesthetic preferences. Installations are performed by our trained technicians who have earned the Super Service Award from Angie’s List for five consecutive years. 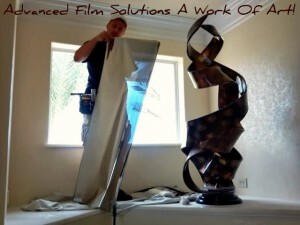 Advanced Film Solutions prefers to install these high quality coatings because of their optical clarity and durability. Home and business owners enjoy comfort and security with our solar security films and Eastman has more choices than any other window film manufacturer. Low E window film for all season energy savings is available with Eastman’s EnerLogic window film. Throughout Tampa Bay, Orlando and Sarasota the film to choose is Eastman and the installation company that has earned the Super Service Award from Angie’s List for five straight years is Advanced Film Solutions. Home and business owners facing high cooling and heating costs thanks to inefficient windows (clear, single pane) have discovered the benefits of low e window films. These thin film coatings are applied to the interior surface of the windows and glass sliders and doors. The film once installed acts as a heat mirror reflecting the interior temperature of the room back into the living space. Standard window films generally reflect or filter out heat. This is extremely effective for tropical climates like Florida. Nevertheless warm and colder climates benefit from Low E films when the winter cold arrives. EnerLogic Low E Film by Eastman Chemical is the most efficient window film in the industry. These proven coatings have maintained comfort and reduced all season insulating costs for the last six years throughout the USA. Many high-profile institutions have had these coatings installed to meet rebate requirements and achieve the fastest payback of any retrofit home improvement projection.